Daily around 150-200 are processed. OPD (Out Patient Department): Timings 8a.m to 2p.m from Monday to Saturday. 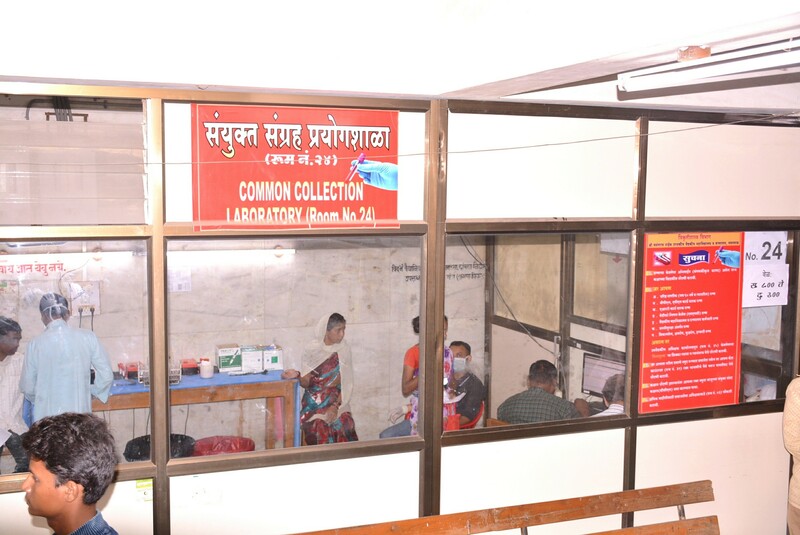 Samples for haematological, microbiological and biochemical investigations are collected under single roof at room no. 24. Reports are dispatched at same place after reporting. Emergency: Hematology and clinical pathology samples are sent to room no. 200. Samples for biochemical analysis are sent to room no. 201. Samples for microbiological analysis are sent to room no. 202. Haematology and clinical pathology: CBC (complete blood count), PS (peripheral smear examination), PS for MP (malarial parasite), ESR (erythrocyte sedimentation rate), solubility test, sickling test, reticulocyte count, DCT (direct coombs test), blood grouping, coagulation profile (PT-INR, aPTT), urine routine microscopy, fluid routine microscopy. [Reporting done on same day]. Bone marrow aspiration [Reporting done next day], bone marrow biopsy [Reporting after 5 days], Haemoglobin electrophoresis [Testing schedule once a week]. Biochemistry: LFT (liver function test), KFT (kidney function test), serum electrolytes (Na+, K+), lipid profile test, blood sugar (fasting and postmeal) [Reporting done on same day]. Shri Vasantrao Naik Govt. Medical College Yavatmal is the leading medical training institute in Maharashtra where we can train and develop our dream. So come on Lets join to be a part of this Institute.